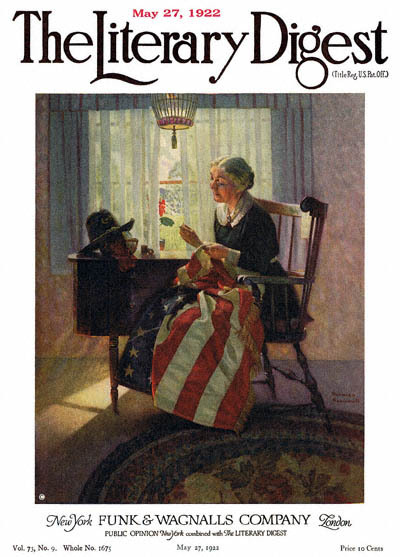 Mending the Flag, this Norman Rockwell painting, appeared on the cover of The Literary Digest published May 27, 1922. This illustration was Rockwell's thirty-seventh picture featured on the cover of The Literary Digest. Begining with his first cover illustration in 1918, Boy Showing Off Badges to the last, The Night Before Christmas in 1923, Norman Rockwell artwork was published on The Literary Digest cover forty-seven times in all. The Digest featured Rockwell artwork on the cover nine times just in 1922.
on page 59 of Norman Rockwell, A Definitive Catalogue by Laurie Norton Moffatt. Sadly, the original oil on canvas painting, 33 x 27 inches or 84 x 68.5 cm, was destroyed in a fire May 30, 1982 at Lucien's Tavern, Berlin Township, New Jersey. With this image, Norman Rockwell evokes familiar patriotic feelings. Mending the Flag was only one of 47 Norman Rockwell Literary Digest covers; here is the list of more Norman Rockwell Literary Digest scans. This was Rockwell's Memorial Day cover for 1922. It was published on the Saturday before Memorial Day on Monday, May 29, 1922. This painting alludes to Betsy Ross who was the most famous seamstress of the American Flag. The flag pictured here, however, has its stars in horizontal rows, instead of in a circle. Rockwell was not attempting to paint Betsy Ross because he was a stickler for detail. Had he meant to paint Betsy Ross, the flag would have been authentic. Rockwell would have commissioned a seamstress to sew an authentic early American flag if necessary. This seamstress appears to be mending the gold fringe on this American flag. On the table is a soldier's hat propped on top of her sewing box. The hat appears to be a keepsake from an earlier war. Rockwell also gives us an insight into the seamstress. At the top of the painting, we can see the cage for her pet bird. Both bird and owner are enjoying the sunshine streaming through the window. Reference your comments on "Mending the Flag." If you look closely at the hat on the table, you will see the "GAR" badge on it. That would be for The Grand Army of the Republic. 1922 would have been a good year for a looking back at the Union troops because they last marched in a presidential parade for Harding. There is quite a bit of meaning in the print if it shows, as I think, a widow of the Civil War working on her husband's momentos. It would be akin to the honors we pay the World War II vets now. Rockwell knew our nation's heart.